An enjoyable walk from Ribblehead to Dent Head via the summit of Blea Moor before returning via Stoops Moss and Black Rake Road. It seems that an emerging theme from my walks over the last 12 months has been revisiting places that I’d not been to since I first began walking in the Dales. Continuing this theme the aim of this walk was to visit the summit of Blea Moor for the first time since August 2005. 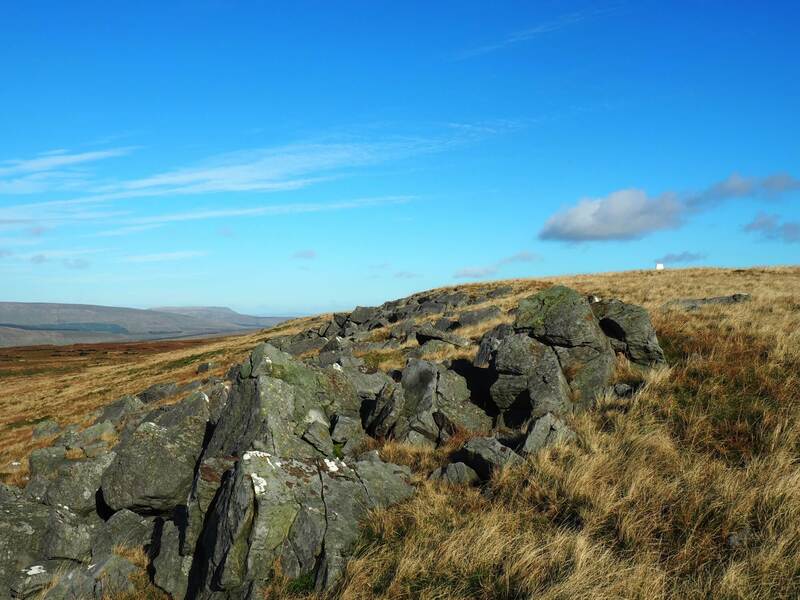 On that occasion I’d visited the summit as part of a 16-mile hike that also included Wold Fell and Cam Fell. Not wanting to walk quite that far this time I came up with this route that utilises a section of the Dales Way for the return back to Ribblehead. Starting at the popular parking area at Ribblehead the start of the walk followed the well-trod path towards Whernside. After passing the magnificent Ribblehead Viaduct the path passed the Blea Moor Sidings before fording Hare Gill. Not long afterwards, before the path crosses Little Dale Beck and the railway line, I took a path on the right heading up on to Blea Moor. Contouring well above the beck this path led to an area of spoil heaps. Turning right I now climbed uphill on a path directly above the Blea Moor Tunnel which takes the Settle-Carlisle railway underground from Ribblehead to Dent Head. Continuing upwards I passed more spoil heaps to meet the first of three air shafts that provide ventilation to the tunnel below. After the second air shaft the going began to ease somewhat. Coming to a brow I left the path to follow a fence to the right. Swinging south the fence led to the modest northern end of Crag of Blea Moor. A bit further on I soon reached the trig point marking the summit of Blea Moor. With all three of the so-called Yorkshire Three Peaks well seen Blea Moor is a good viewpoint. A short walk further south to the rash of gritstone boulders also brought the Ribblehead Viaduct into view. After taking a number of pictures I took a thin path above the boulders back to the fence. Crossing over I visited what seemed to be an old quarry from where an old trackbed or ruined flue led me straight as an arrow back down to the path. With the views now favouring the fells above upper Dentdale I descended past a third and final air shaft. Shortly afterwards I crossed a stile and into the plantations of Mossy Bottom. Since my last visit a large swathe of the plantation has been chopped down. Indeed I was not very impressed with one section where some felled trees had been left laying across the path. Emerging from the far end of the plantation a very muddy section was encountered just above the exit from the Blea Moor Tunnel. A reward for having to negotiate the shin deep slop was the two attractive waterfalls just below the path. Once again on much firmer ground the path crossed a stream by a footbridge to lead to the attractive Dent Head Farm House. Passing through the yard the path then crossed another stream. Descending a couple of pastures it then crossed the River Dee via the lovely packhorse bridge at Bridge End Cottage. Turning right I carried on uphill on the quiet road to reach Dent Head Viaduct. Continuing on for another two-thirds of a mile I finally left the road at a gate on the right. The next section of the walk followed the line of both the Dales Way and Ribble Way. It also followed a path that is marked on the map as ‘Black Rake Road’. As the moist path crossed Stoops Moss I thought wryly to myself that my boots would soon be black from mud and peat. After a while the path thankfully became a bit more solid again. This section featured some fine views of upper Ribblesdale including Cam Fell and, further down the valley, Pen-y-Ghent. Continuing on a path above High Gayle the path finally dropped back down to the road after passing the house(s) at Winshaw. All that was left was to turn right and follow the road back to the car. It can be a busy road but as the road is not enclosed there was ample space to escape on to the verges. This was a fine walk, if a little muddy in places, and one that makes a good alternative to Whernside. I even treated myself to a little exploration of Runscar after I’d got back to the car. With a lovely limestone scar and some interesting looking caves it is definitely somewhere I need to investigate further. I remember doing almost the very same walk on my own back in the late 80’s, but starting from the lovely Dent Youth Hostel. I don’t remember much of the walk apart from walking up to the Blea Moor tunnel and coming down into Dent Head farm. The memory plays tricks I think! Looks like you had a great day for your walk. Shame about the ‘shin high slop’ – I like that phrase!